Once the winter snow has melted away, it's time to get back to enjoying the fresh air at the Amish Western Red Cedar Table with Two Backed Benches. Create your own size as we offer four for this cedar outdoor furniture. Create a table for a small family or a large one to host those Saturday afternoon barbecues. Two spacious benches with generous backs line the sides of this lovely cedar table. 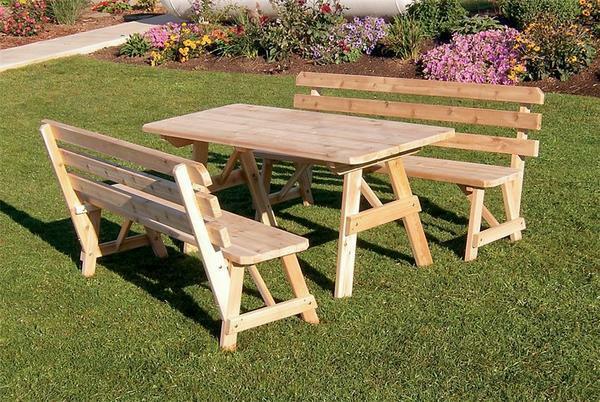 Lean back and enjoy the sunshine as you dine, relax, visit or play at this Amish made outdoor table. There's nothing like a picnic out in the fresh air and we have the perfect outdoor furniture to help host it! View more selections from our Amish Garden Furniture Collection and enjoy custom outdoor furniture for your home. Our cedar wood furniture is made with Western Red Cedar Wood, the most preferred and superior quality of cedars.